We are able to offer appointments for patients to receive their regular prescription injectables from our nursing team, for example B12 and hormone injections. Our specialist asthma nurses will help you manage your condition through annual reviews and medication checks. If you think you are overdue a review appointment, please contact our reception team. Every year in the UK, around 3,000 women will be diagnosed with cervical cancer. Reduce your risk by attending regular screening. If you have received an invite to book your screening appointment, call our reception team who will get you booked in. Our nursing team administer vaccinations to all children until they reach school age. The NHS Choices website is an excellent resource for finding out more about these vaccinations and for answering any worries you may have. Click here for further information. Chronic obstructive pulmonary disease (COPD) is the name for a group of lung conditions that cause breathing difficulties. COPD is a common condition that mainly affects middle-aged or older adults who smoke. Many people don't realise they have it. The breathing problems tend to get gradually worse over time and can limit your normal activities, although treatment can help keep the condition under control. Through regular monitoring, our specialist nurses can help you manage your condition. If you think you are overdue a review appointment, please contact our reception team. In the UK there are an estimated 2.3 million people living with CHD and around 2 million people affected by angina (the most common symptom of coronary heart disease). Through regular monitoring, our nursing team can help you manage your condition. If you think you are overdue a review appointment, please contact our reception team. Our nurses run annual reviews for all patients who are over 18 who have Type I or Type II diabetes. The review is an opportunity to discuss diet, lifestyle and general management of their diabetes and any complications. Referrals may be made following attendance at these clinics to the Dietician, Podiatrist, Ophthalmologist or Retinal Screening or our local Diabetes Specialist nurse if required. If you think you are overdue a review appointment, please contact our reception team. If you struggle with blocked ears but are not in any pain, it may be appropriate for you to see one of our nurses who will consider whether you need to have your ears syringed. You will be asked to use ear drops for at least 7 days prior to your appointment; please speak to the pharmacy about the most appropriate drops to use. If you are suffering ear pain, you will not be able to have your ears syringed. Please call and speak to reception to book an appointment with one of our duty nurses. We offer confidential advice on sexual health and contraception for patients of all ages. Please note that we are unable to test for sexually transmitted disease at the surgery. You will need to attend your local CASH clinic – click here for information about your nearest clinic. We strongly recommend a yearly flu vaccination for patients over 65, and those with chronic illnesses such as diabetes, heart disease and kidney disease. We also run a programme of flu vaccinations, via nasal spray, for eligible children. In addition, we recommend the Pneumonia vaccination to those patients over 65 years of age. Our vaccination campaign normally begins in late September, click here for further details. Our nurses run annual reviews for all patients who have Hypertension (raised blood pressure). During your review appointment your blood pressure will be checked, your weight and height measured and your lifestyle will be discussed with you, such as diet, exercise, smoking and alcohol habits. The nurse will also discuss any blood pressure medication that you are on. If your blood pressure is not at target, an action plan will be agreed with you to improve the result. A FREE 20 minute NHS Health Check is offered to all patients aged 40-74. An invitation letter will be sent out to those aged 40, and thereafter every 5 years till the age of 74. To check if you are eligible or to make an appointment for your FREE health check, please contact the reception team. The Health Check will be carried out by one of our Health Care Assistants who will assess your risk of developing heart disease, stroke, type 2 diabetes and kidney disease and will provide you with simple and practical steps to help you reduce that risk and stay healthy. The check is based on straight forward questions and measurements such as age, family history, height, weight and blood pressure. There will also be a simple blood test to measure your cholesterol level. If you are outside the age range covered by these checks and concerned about your health, you should make an appointment with your GP. We offer a large number of daily appointments for you to have your blood taken by one of our experienced phlebotomists. We also offer appointments for blood pressure monitoring or ECG at the request of our clinicians. If you are worried about your blood pressure, please call into reception and use the machine we have situated there. Record your results on the form provided and this will then be passed to a clinician for review. If they have any concerns about the results they see, you will be invited in for an appointment. Our nursing team are always happy to see you for dressing wounds or removal of stitches. Please book your appointment as soon as you are aware the date your stitches need to be removed/wound redressed. We are pleased to offer appointments with our specially trained Health Care Assistants to help you give up smoking. Please contact reception to get booked in. We are able to offer standard travel vaccinations to our patients provided we receive sufficient notice of your intended departure. Please complete and return a Travel Assessment Form (available from reception or by clicking here) and one of our nurses will be in touch to let you know what vaccinations you require. We must receive one form per patient travelling. Not all travel vaccinations are covered by the NHS and may require a private prescription. Click here to see a list of current charges. If you require a vaccination that we are unable to provide you will need to contact your nearest travel clinic. This service is run by Chris Glass, Pharmacist. Our nursing team are responsible for seeing all our patients who take anticoagulant medication such as warfarin, who need to have their blood monitored regularly. A simple finger prick test is performed and an immediate result is given, to confirm or adjust the warfarin dose as necessary. This quick and simple process enables patients to regularly check the clotting rate of their blood while taking anticoagulants, usually without the need for more invasive blood tests or delays whilst waiting for their results to come back from the hospital laboratory. In order to assess your condition or reach a diagnosis, you may be asked to undergo further tests or investigations. These will normally be carried out by a Practice Nurse or Health Care Assistant here at the practice, or at a local hospital. A blood test usually involves the phlebotomist taking a sample from a blood vessel in your arm. The usual place for a sample to be taken from is the inside of the elbow, where the veins are relatively close to the surface. We are able to take blood samples from children over the age of 6. These are commonly taken from the back of the hand which will be numbed with a special cream before the sample is taken. If you have any concerns at all, please talk to one of the reception team who will do their best to help, for example by booking you a longer appointment. It's really important to remember to drink plenty of water before your blood test, whether it's a fasting or non-fasting blood test. This makes it easier for the nurses to take a sample from your veins. All blood samples have to be taken in the morning, as they are delivered to the pathology laboratory at the Royal United Hospital at lunchtime. Please note that blood tests can only be taken if authorised by a clinician. Please do not book a blood test without consulting your GP. If you are asked to provide a urine or stool sample, please collect the appropriate container from reception. We are unable to accept samples in other containers. We are also unable to accept samples unless they have been requested by a clinician. We are fortunate to have a local walk-in x-ray service at Melksham Hospital. This service is available on a Wednesday and Friday between 10:00 – 13:00 and 14:00 – 16:00. Attendance is by referral only – you cannot attend unless you have been referred by your GP. Appointments for ultrasounds or other scans will normally take place at the Royal United Hospital in Bath. They will contact you directly with an appointment. Results are transmitted electronically from the pathology laboratory at the Royal United Hospital, back to the requesting GP who will then review them. Your GP will be able to advise you when the results are likely to be available. Once your results have been viewed by the requesting doctor, they will give instructions to the reception team if any action is required. Please note that the Receptionist may be unable to relay your specific results; they may simply ask you to make an appointment for you to discuss the result with the doctor. The doctor will have advised the receptionist the degree of urgency required. The GP’s will not contact patients with ‘normal’ results. It is the responsibility of the patient or their carer to telephone the surgery for the test results. Please call us on our general enquiries line on 01225 703236 after 2pm. Finally, please note that the practice has a strict policy regarding confidentiality and data protection and we will only release test results to the person to whom they relate unless that person has given prior permission for the release of this data or if they are not capable of understanding the results. If your GP feels it is necessary to refer you to see a Consultant or other specialist, they will write to them detailing the history of your condition, any medication currently prescribed and the results of any tests or investigations conducted. A short summary of your medical history will also be attached. The GP will prioritise your referral by noting whether your referral is routine or urgent. The referral is then processed by our medical secretaries. Many of these referrals will be processed through the Referral Support Service (RSS) at Southgate House in Devizes. This is not a hospital or clinic and they will not be giving you your treatment. The service is there to make your booking experience a much easier and more personal one for you. The service can help you choose where and when you can have your treatment and book an appointment with you whilst you are on the telephone. If you have been referred via this service it will say so on the referral paperwork we send you. If your referral isn’t being processed through the RSS, the specialist will determine how quickly you need to be seen and an appointment will be sent out to you from their team direct. If you have any queries relating to your hospital appointment, please contact the specialist’s secretary for more information. If you need to cancel or rearrange your appointment, please contact the hospital or clinic directly to do so. Patients who have a non-emergency medical need and require help with transport to reach their hospital appointment can apply to the Non-Emergency Patient Transport Service provided by Arriva Transport Solutions Ltd. The service runs 24 hours, 7 days a week. Call the Patient Transport Advice Centre on 01278 727410 between 08:30 and 18:30, Monday to Friday (charged at the local standard rate). The NHS staff there will ask you about your needs and if you qualify, will book your transport with Arriva on your behalf. If you don’t qualify, they may be able to suggest alternative means of transport for you to get you to your appointment. We are very proud of the excellent range of surgical services we offer here at Spa Medical Centre. We provide a Carpal Tunnel, Vasectomy and Minor Skin Cancer Service to all eligible patients throughout Wiltshire, once they are referred to us by their own GP. Dr’s Armstrong, Rigby, Matthews, Teare and Pearson, and Debbie Todd, our Surgical Nurse, all carry out surgical procedures in our dedicated theatre suite and we welcome a Plastic Surgeon and Consultant Dermatologist to the team each week too. This is an opt in service which means that you are able to book your appointment directly with them and don't need a referral from your GP. They are able to provide several levels of support depending on your needs, from signposting you to online resources, booking you on one of their courses or through one to one appointments, held here at the surgery. IAPT’s trained practitioners will support you to understand more about the difficulties you are having and help you learn to use some psychological techniques to tackle or cope with these difficulties. Or if you wish to be seen for a one to one appointment, please telephone their team in Devizes on 01380 731335. The service covers all age ranges, providing assessment, treatment and advice for a wide range of conditions from tennis elbow and back pain to rehabilitation following surgery. Click here for further information about the service. We are fortunate to have a Podiatrist, Fiona Stubbs, running a private clinic once a week at the Practice. Fiona can be contacted on or you can book an appointment with one of our reception team. Please note that payment for these appointments is by cash only. or contact health.trainers@wiltshire.gov.uk or call them on 0300 003 4566 for more information. A diagnosis of dementia should not mean an immediate end to normal life, but many families will need specialist support to help adjust to and manage the changes it can bring. Alzheimer’s Support provides a range of practical services to enhance life and promote independence for those living at home with dementia in Wiltshire and for their family carers. You do not need a formal diagnosis of dementia to access their services. Every fortnight we welcome Wendy Clayton, a Dementia Advisor with Alzheimer’s Support, into the Practice to meet and talk to patients who may be concerned about dementia. Wendy is able to signpost patients to her team for help and guidance. Alzheimer’s Support offer an amazing array of events and activities, including their award-winning day clubs and much-valued one-to-one home support. Community activities include Singing for the Brain, Movement for the Mind, memory cafes, art groups, a discussion group, wildlife club and many more - all designed to keep minds and bodies active and reduce isolation. They also have services to support family carers, including monthly carers' groups and twice-yearly training courses. To find out more, visit their brilliant website at www.alzheimerswiltshire.org.uk or call 01225 776481 for further information. A new Leg Ulcer Clinic and Wellbeing Club has opened in Melksham, running every Thursday morning from 09:00 – 11:30 at Spencer’s Sports and Social Club, Beanacre Road, Melksham. Patients can receive treatment from NHS nurses and then spend social time with other members and friends. Refreshments are available. No appointment is necessary to attend the Leg Ulcer Clinic, you can drop-in and wait to be seen by one of the team. The services available at the Leg Clinic will continue to grow, with the Falls Clinic moving from Melksham Hospital to the club. There is also a drop-in Carers Café once a month, organised by the Spa Medical Centre Patient Reference Group. To help our patients who care for others, our Patient Reference Group have set up a Carers Café which will run the third Thursday of each month, at the same time as the Leg Clinic. This is a great opportunity for Carers to meet up and chat, enjoy a cup of coffee and seek advice about any worries or concerns that they have. Not everything the practice does for you is covered by the NHS. The Doctors are happy to carry out medical examinations, for instance for insurance and driving licences, by appointment but because these examinations are outside NHS work, they are subject to a charge. We aim to complete requests for Non NHS work within 21 working days. Please give us as much notice as possible. Please click on the link below to view our current Non-NHS services and fees. This service is carried out by a number of GPs in the practice and consists of a physical examination when your baby is 6 - 8 weeks old. It also allows an opportunity to discuss any problems or concerns you may have with the GP. You will receive an appointment for your baby via the Practice Administrator at Spa Medical Centre. 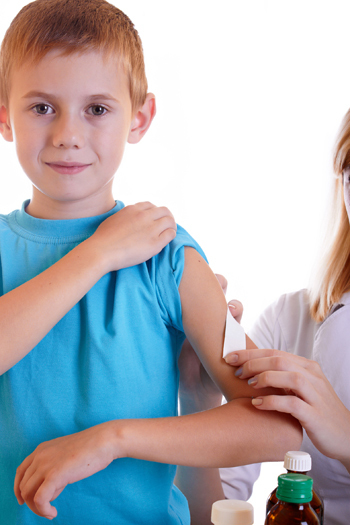 Your Health Visitor will advise you when your child needs immunisations. These are very important to protect you child and to eradicate serious disease from the population. They are all very safe. There is no need to delay immunisations because of a slight cold. If you are unsure, there is always a GP or Nurse available to check your child before immunisation. Child Immunisations are by appointment. You will be contacted by phone or letter with an appointment time and date for your child’s immunisation. Please phone Marcia Weeks on 01225 898009 to cancel if you are unable to make the appointment, it can then be offered to someone else. Children who are behind with this schedule should catch up as soon as possible. Please ring Marcia on the number above and she will find out the current guidance and get back to you. Virgin Care provide Wiltshire Children’s Community Services across the county, looking after the physical, medical and mental health and wellbeing of children and young people up to the age of 19 years old. They provide everything from public health nursing (also known as health visiting and school nursing), to specialist support for children and young people with physical sensory or learning needs and disabilities.